Moving your multicultural communication from translation to transcreation. America is rapidly moving from “e pluribus unum” (out of many … one) to an authentically hybrid nation. Multiculturalism is redefining what it means to be American today. With the changing appearance of the U.S. population comes new definitions of the U.S. consumer and new dilemmas for marketers trying to reach those whose tastes, customs and language may differ from what is commonly know as “general market”. Culturally relevant marketing plans will become increasingly critical as the population becomes more diverse and their buying power becomes more significant. So how do you effectively court diverse markets when the consumers speak different languages, have different customs and values or diverge from the general market? To reach and influence these consumers takes insight, familiarity, strategy, and creative ability. It takes the right agency: an agency like Hispanidad. At Hispanidad, we offer something unique – an experienced, integrated team of marketing professionals dedicated to putting the right accent on your marketing so it generates a positive, and profitable, response. A team with the creative talent and comprehensive solutions to get you in, get you noticed, and get you results. 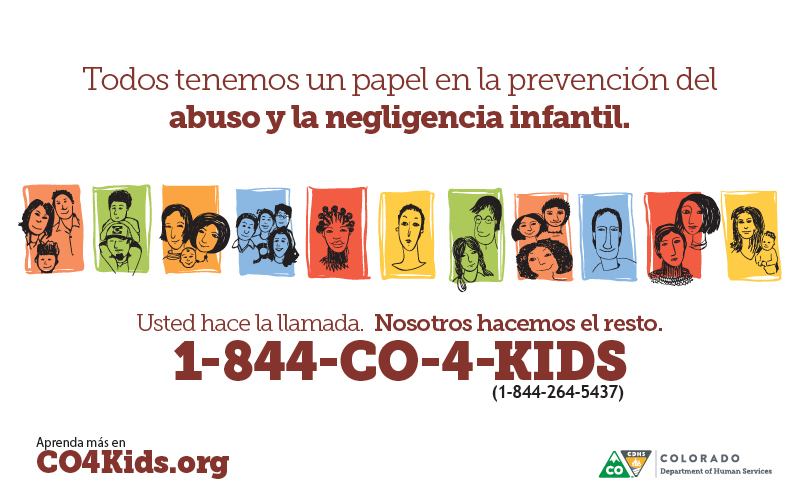 Hispanidad partnered with CDHS to promote greater safety for Colorado’s children via a new statewide hotline to report child abuse and neglect.